"An easy recipe for a flavorful addition to your appetizer assortment! This appetizer tastes best when served fresh and cold. Keep in a cool place until serving." Place eggs in a saucepan and add enough cold water to cover; boil eggs for 10 minutes. Drain. Let eggs cool in the refrigerator for 15 minutes. Mix mayonnaise, celery, onion, mustard, garlic powder, and vinegar in a bowl. Peel eggs and slice in half vertically; remove egg yolks and add to mayonnaise mixture. Mash yolks into mayonnaise mixture, then stir until thick and creamy. Transfer yolk mixture to a resealable plastic bag. Snip a corner from the bag with scissors and pipe yolk mixture into the egg whites. Sprinkle paprika over eggs. Chill in the refrigerator for 20 minutes before serving. 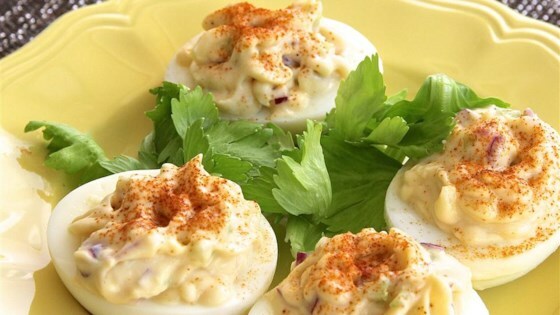 This is a good, old-fashioned deviled egg with a little chopped celery and red onion to give it some crunch. Nothing not to like here! FAAAAR too thin. It comes out to a syrup consistency. You could POUR it into the eggs. Had to boil 6 more at the last minute to thicken it up. The mixture needs to be thicker. Maybe next time I'll cut back on the mayo & add just a pinch of salt. 1 cup of mayo is way too much............1 or 2 tablespoons is plenty for this recipe. This is the fifth recipe from your site that has been way off when it lists the ingredients. Add black olives and a slice of jalapeño for garnish and kick! Easy to make, delicious to eat! Added some black pepper, personal taste. But I love this recipe! Very good easy recipe however I added some sweet pickle relish and a bit of sugar to taste. I also just used some celery seed instead of fresh celery because I didn't have any fresh on hand. Yes I will definitely use less mayo next time.